Not long ago, I purchased a pair of Polk Signature S60 speakers and, to be perfectly honest, I was (still am) quite impressed by them. The S60 doesn't do anything "wrong" to my ears. That said, I recently came across a deal on the LSiM 705 thanks to @Dabutcher that I simply could not pass up. Many veterans on the forum indicated that the LSiM is a substantial upgrade over the Signature Series. While the Signature S60 represents to TOTL in the that series, the LSiM 705 is one down from the TOTL LSiM 707 in that series. However, the LSiM 705 is considered to be the "sweet spot" of the lineup so, I had no reservations in going with the 705 > 707. Interestingly, I purchased both the S60 and the LSiM 705 without hearing them first. I purchased both pairs of speakers from authorized Polk retailers as well. The LSiM arrived yesterday but I wasn't able to do much aside from getting the massive boxes into our apartment (with some help from UPS and our building super). 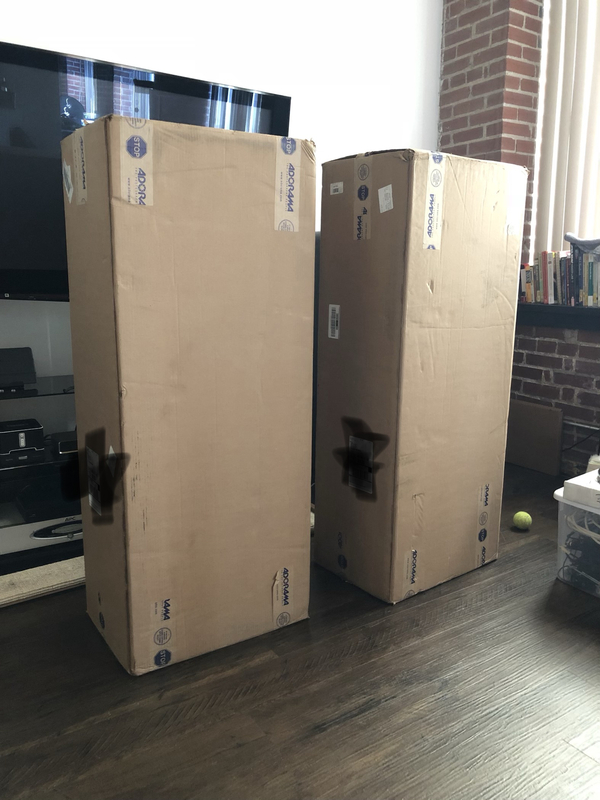 This morning, before my wife left for work, we were able to unbox one speaker and then she had to head out. So, what strikes me as the major differences between these two speaker offerings by Polk are that the LSiM is much heavier than the S60. The 705 has a beautiful finish compared to the S60 but the S60 isn't "bad" by any means. The 705 is narrower and not as deep as the S60 but the 705 is taller than the S60. The S60 is far more stable than the 705 due to the feet being outside the sides of the cabinets. The S60 is a "new" design while the 705 is showing its age. I like the Mt. Vernon Cherry finish as it sort of matches the Cherry finish on my AV rack but the black walnut on the S60 pretty much goes with everything. My wife likes the looks of the 705's. She said that they look "fancy" with the black lacquer on the front and the Cherry wood on the sides, top, and back. 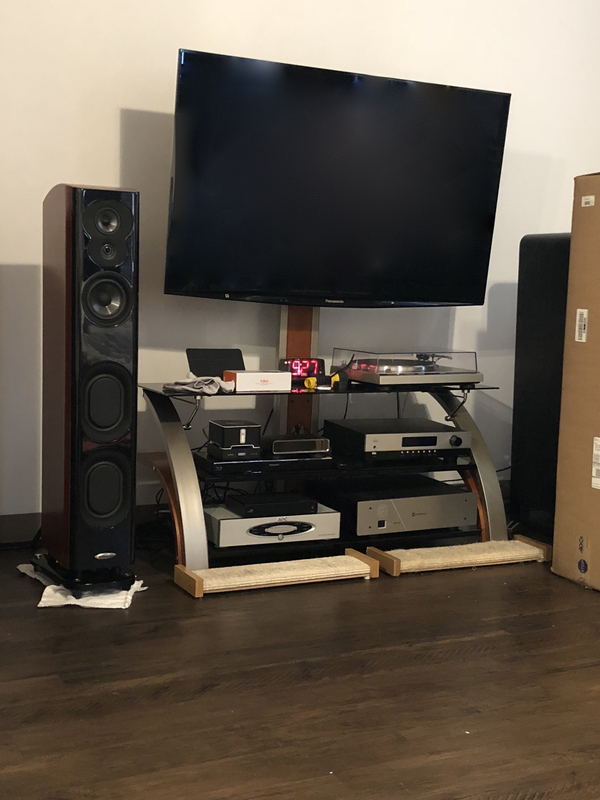 We got the second 705 setup late this evening so I haven't had any time to listen to them (Ah, the joys of apartment living). As I understand it, the 705's need some time on them before they sound as they are intended to sound so I will just let them play for several days before forming any opinions. I did not notice the need for the S60's to "break in" as they sounded very good right out of the box. I will report back after the 705's have ~ 50 hours playing time. Thanks again to @Dabutcher for making me aware of the deal & to @DSkip & @F1nut for their insights on the differences between the Signature Series and the LSiM series. Much appreciated! I do have some questions regarding the model #'s though. Why was the previous LSi series numbered the way it was with the LSi7, LSi9, LSi15, & LSi25? Why the numbering system for the LSiM at LSiM 703, 705, & 707? Seems erratic to me. The numbering system doesn't exactly roll off of one's tongue either. Any input would be appreciated. Congrats on the purchase. I'm looking forward to your comparison to the S60's and how much better they sound. Nice looking setup. Congrats on the new toys. If the S60's sound better, then the 705's will be sent packing! Thanks man. The setup is a hot mess in those photos. I'll snap some more pics once I get things going & everything is cleaned up. Congrats Victor! I have been on the fence getting these to replace my modded SDA 1C's, but I........I...... just can't replace the SDA's. While it did enter my mind for a minute to just rotate both pairs in and out, that's just not practical nor monetarily responsible. So with that said, I am looking forward to a good in depth review. I was able to listen to about 3/4 of an album before I had to leave this morning. I noticed that I have to turn up the volume level higher for the 705’s vs the S60’s. However, the sound is very different between the two speakers. The S60’s are quite a bit more forward in their presentation. It’s not necessarily a “bad” thing but I really prefer the balanced sound, from top to bottom, that I’m hearing from the 705’s. People have commented that the 705’s will take at least 40 hours to “break in” so, that means, they’re only going to get better from here. I will say that the 705’s are eerily reminiscent of the best speakers I’ve ever owned, which were the Avon Schweikert VR2 floorstanders. The bass on the 705’s is solid and makes it’s presence known but, like I said before, it’s balanced with the mids and the highs. I’m looking forward to spending more time with these speakers. If detail is your thing, the S60’s will give it to you in abundance. Thankfully, it’s not a harsh or sibilant speaker and you can listen to them without fatigue. When watching movies, they are simply fantastic. We live in an apartment and I don’t use a sub. With the S60’s, I never felt the need for it. Now, after listening to the 705’s for a brief period, I can see adding a sub to bring the bass up a bit to match the high notes so everything is on a more level playing field when listening to music, not movies. I’m curious as to how movies will be presented through the 705’s. I may have to run them through the TV speakers alone so I don’t disturb my neighbors! lol. I also want to mention, again, that the Mt. Vernon cherrywood finish is really beautiful. The black lacquer on the front is pretty sharp but the rubber “baffles” around each driver looks kind of cheap. I was impressed with the folder and booklet included with the speakers. High class and high quality IMO. I also like that one of the inserts in the LSiM folder welcomes you, the serious listener, to the Polk family and invites you to join the Club Polk online forum. This brings back memories of a little yellow insert that was included with the manual for my first pair of Polk speakers, the R30 floorstanders, which also invited me to join the Polk Forum. LOL, what I meant to say is the 705's sounding better. The bass should improve with break in. The rubber baffles serve an acoustic purpose as well as cosmetic. That's interesting. Will the bass become more recessed or more prominent? I kind of like it where it is. I don't ever see you giving up the SDA's Brock. I was there when you bought them! You were on the fence about giving up your LSi9's but it seems to me like you made the right decision as you've been deliriously happy with the SDA's! C'mon Victor....rubber loosens up, bass gets better. More good things for me to look forward to with these 705's! I was told the ring radiator tweeter was the thing that needs time to open up. The crossovers need time on them, before things start sounding as they should. But I'm glad that your initial impression of them seems to be positive. @F1nut, Jesse, do you have any info on the model numbers for the speakers? Why they are configured the way they are? Thanks Drew. Yes, these are putting out a positive first impression for me (thankfully). I also owe you a note of thanks for your input on the LSiM line as well. The black lacquer on the front is pretty sharp but the rubber “baffles” around each driver looks kind of cheap. Given what went into making the LSiM look so nice, I'm sure the engineers/physicist won out in making the baffle out of rubber for deadening purposes. I'm sure you've seen the Tech brief but just in case you haven't. I am deliriously happy with the SDA's, but part of me wants to dip my toes in other offerings if for no other reason than to hear a different presentation. For me, I'd have to keep the SDA's and most likely after playing around with other speakers, I'd probably go back to the SDA's. The sound stage the SDA's create is highly addictive, throw in some good tube soul and it's such an addictive, enjoyable presentation, I'd hate to muck that up. I will say if you are already saying these are as good or better than the Von Schweikert VR2's, you have my attention. I really enjoyed those when I heard them. The only LSIM series I've heard were the pre-production models brought to a Polk Fest so long ago. I'm sure the final product sounds a bit different. I was impressed with them back then before they had the final voicing. Oh, these are merely reminiscent of the VR2's at this point. Obviously, others have chimed in and concur that these have a way to go before they hit their stride. That said, nothing else Ive owned has been THIS reminiscent, to my ears, of the VR2'S. One thing the 705's may have difficulty replicating is the ambiance driver located on the back of the VR2's which sent frequencies from that driver to the wall behind the speaker. Also, the transmission line enclosure for the bass drivers had them hitting 20Hz. Those babies were/are remarkable. If the 705's get close to that sound, I'll be a very happy camper. No idea.....someone liked odd numbers? I know on my 703's it was way more than 40 hours break-in before they really shined. The bass improved as did the overall sound after extensive break-in, my puny brain has trouble remembering that far back but I think it was in excess of 100 hours. Don't judge too much yet they'll go up and down for awhile just like any break-in, and as mentioned above they have a good ways to go before they hit their stride. Just last evening I was watching some Game Of Thrones on blu-ray and again thought to myself how I enjoy the LSiM's. It also seems somewhat trite to say it, but it really seems the better the gear and the signal they receive the better they will respond, I think a lot of people never realize their real true potential. I'm currently running the 703's with a 704 for blu-rays and television, no sub necessary in my small room. 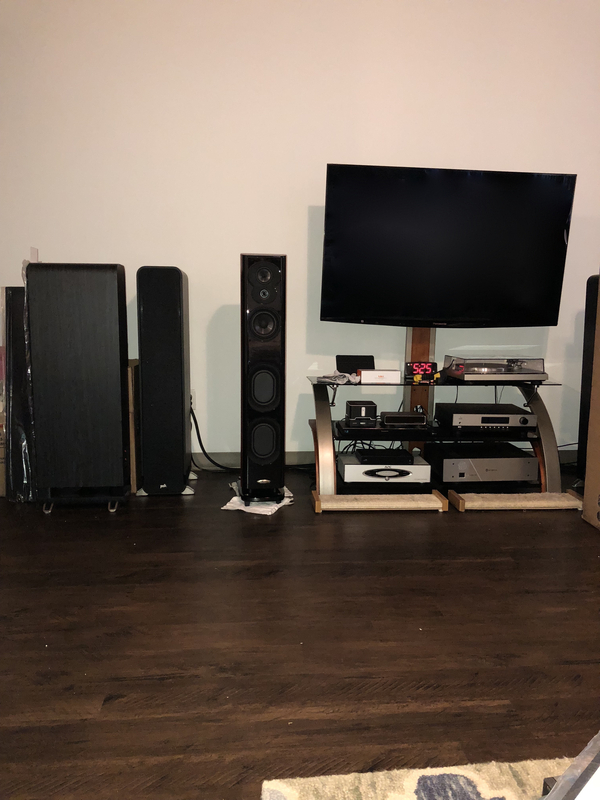 I was on the fence about getting some 705's, that price's a steal, but I just have too many floorstanders already. Still may do it just for kicks we'll see. Congrats on getting these amazing speakers! Thank you for your insights. I did read them elsewhere on the forum while I was researching & contemplating the move away from the S60's. I'm really curious to hear if you notice any discernible changes with the way the high frequencies are represented, as I definitely did over the course of the first several weeks with my 703s. Congrats on the speakers, can we get a close up of that gorgeous veneer? When things get cleaned up a bit more I’ll snap another picture for you all but right now it looks a mess. Congrats Victor! So long as you didn't cringe right off the bat when you started listening to them, you will get used to the different sound. Do you have them properly amped? No one will ever convince me that big speakers don't require a powerful amp to bring them up to their full potential. I look forward to reading your review and seeing better pictures! Well, truth be told, I was never cringing when I listened to the 705's. lol. They are very nice right out of the box. If they're going to get even better, I am in for a very sweet treat! I will post better pictures as soon as I get things organized again.